Early in March we held an event with Eoin Colfer, world renowned author of the Artemis Fowl series, to launch our ‘books to Zambia‘ initiative. Just recently we had the pleasure of distributing those books to excited children there. 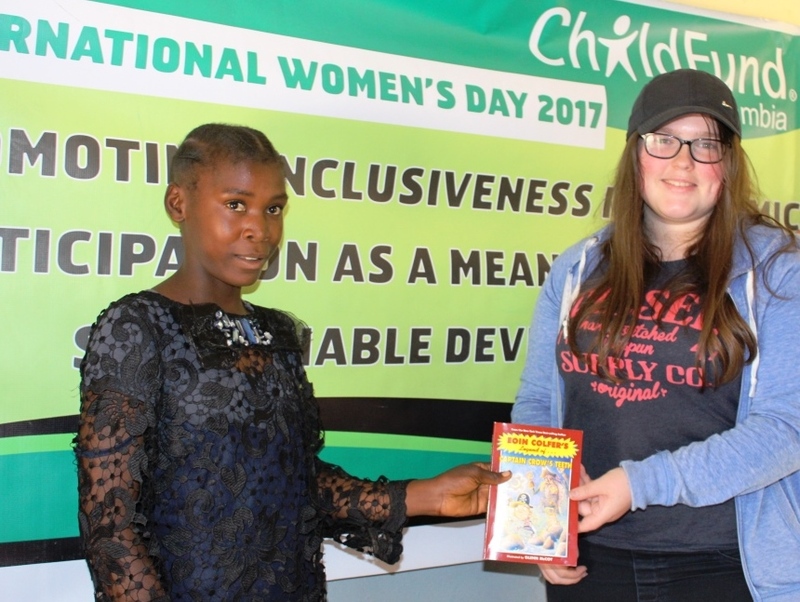 Loveness Mwansa is a twelve year old girl sponsored by ChildFund supporter and world renowned author Eoin Colfer, creator of the much loved and hugely successful Artemis Fowl series, amongst many others. Some weeks ago Eoin generously lent his time to help us launch; ‘A books Journey from Dublin to Zambia’. 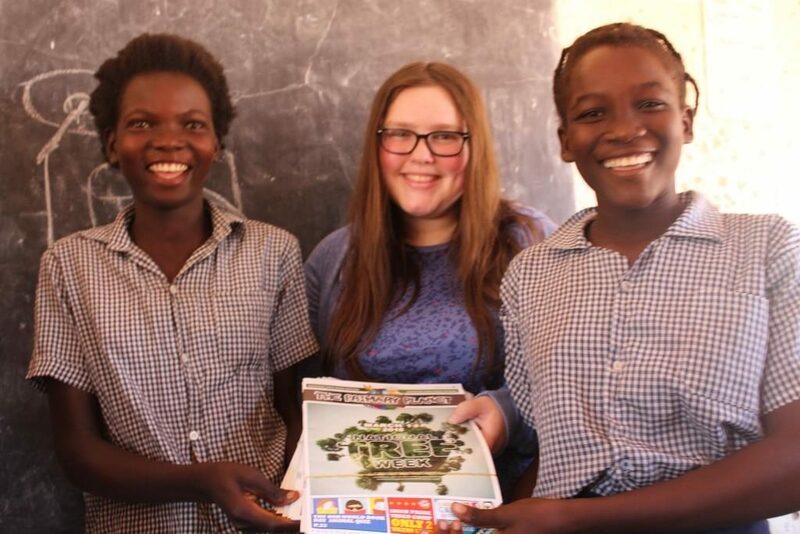 As the title suggests, the initiative was concerned with getting books to children in Zambia who might otherwise struggle to avail of reading materials to assist them in the development of their English literacy skills. Just recently we visited the small rural community of Chitemalesa in Zambia to fulfil this commitment. Over three enjoyable hours there, we got to meet Loveness, her mother and father, and other excited children – all of them curious to see the books and material we had brought with us. 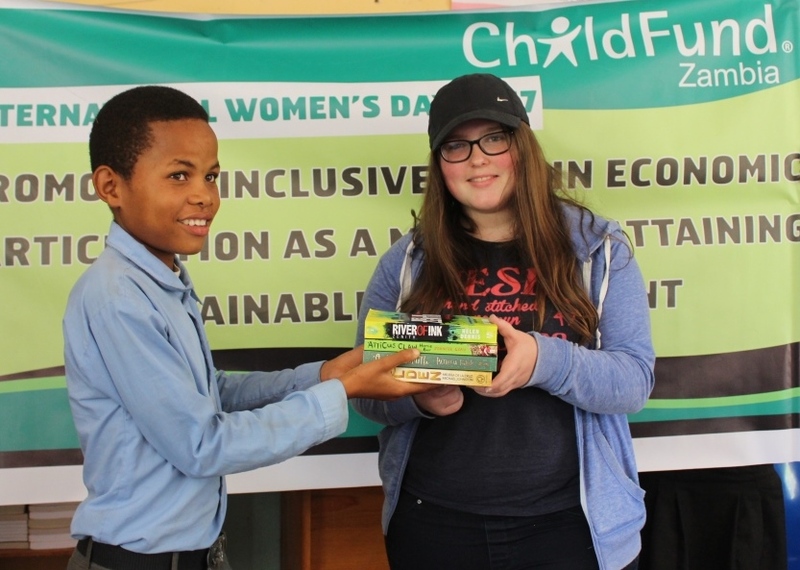 Young Sasha Lorigan (15) was a major driving force behind the initiative, undertaking it as a global and social development project. The schoolgirl from South County Dublin spent considerable time and effort lobbying book stores, publishers and other retailers in the hunt for donations. Sasha had the honour of presenting an Eoin Colfer book to Loveness (above), which contained a personal message written by the author himself. Loveness wasn’t the only child to benefit from the joy of new reading materials. 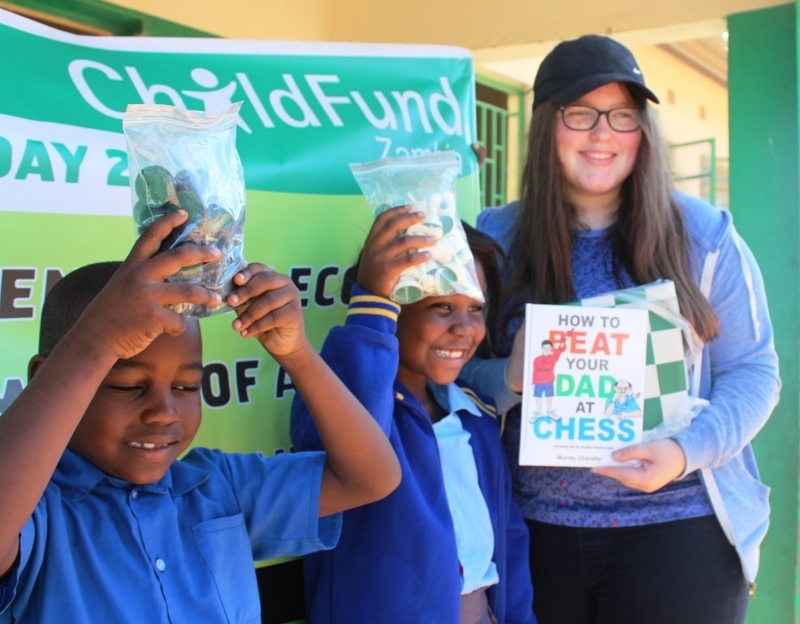 Many children and youths in Chitemalesa were able to enjoy a plethora of books, toys, magazines and other items we brought with us, including chess kits for children donated by another loyal and generous ChildFund supporter, Alex Baburin, Ireland’s only chess Grandmaster (thank you Alex!). The book haul included; 34 Novels, 46 Pre-School story books, 6 Story books, 21 Story books written by the child’s Sponsor Eoin Colfer, 25 Pre-School teaching aid books, 91 Magazines, 66 Toys, and 80 pens! Loveness lives in an area called Chitemalesa in the Chongwe District of Zambia. Its a mountainous area located off the Great East Road connecting Zambia to Malawi and Mozambique, about an hour’s drive from Zambia’s capital, Lusaka. The project there hosts 145 children supported by Irish sponsors and a further 350 or so supported by ChildFund sponsors from other countries. ChildFund works with a local partner on the ground to serve children and their families in the community, and to identify their needs so that we can assist them in practical ways. Daily Life In Chitemalesa see’s 3 out of 4 families live below the poverty line, earning just $40 to $90 a month through farming and other work. Families living along the Chongwe or Rufunsa Rivers typically grow vegetables in their gardens. Other crops include maize (corn), sweet potatoes, groundnuts (peanuts), sugar cane, and soya beans. Most families here live in single-room circular pole and mud houses, with floors of clay and thatched straw roofs. Houses are grouped together and cooking is done outside, over a three-stone fire or with charcoal. Most families don’t have their own water supply. There’s no electric utility, but some families have solar lamps. ChildFund works to assist children in communities like these by creating the best possible environment we can, to help them develop in a healthy, happy and safe way. You can contribute to this meaningful and rewarding work by becoming a child sponsor. Your patronage can make an enormous difference to children like Loveness living in disadvantaged communities across the world where ChildFund works. A monthly donation of just €22 can help set a child on a pathway to a future or promise and opportunity. Our child sponsorship programme offers a unique opportunity to connect with families in the developing world and affect their lives positively through an act of kindness. Write to us at ChildFund Ireland, 22 Windsor place, Dublin 2; or call us on 01 6762128 and we will be delighted to tell you more about child sponsorship.